Regardless of what you may have heard, reports about the death of U.S. manufacturing have been greatly exaggerated. In truth, American manufacturing is ticking along handsomely, almost guaranteed an ever-brightening future. What that bright future looks like, however, and who (or what) is doing the work…that’s up for grabs. As artificial intelligence, the Industrial Internet of Things, increasing automation and a new concept of work come literally online, maneuvering the ins and outs of the industry in the days to come is anything but a gimme. Tech is remaking the world, again. Old standbys like brand-awareness, a massive customer base, legacy products and oodles of capital matter little. A vastly transformed consumer with a seemingly infinite number of options awaits your next move. If you’re going to compete in this new economy, you’re going to have to go about it in a whole new way. Great ideas need great execution. Having a great idea isn’t worth much if you don’t have the means to carry it out. In today’s business environment, “means”—more often than not—means partnership. It’s why Volvo, Otto and Uber have teamed up to make self-driving cars. It’s why Johnson & Johnson and Google have formed a robotic surgery dream team. It’s why Apple abandoned dreams of manufacturing its own automobiles to focus on software for others to use in theirs. The bleeding edge of tech isn’t just about tech, it’s about who’s on your team. Take the rise in robots. During the first half of 2016, North American companies sold a record number of robots, and they did so bringing in less revenue than they had the previous year when they made fewer. In other words, it’s getting cheaper to buy a robot, and if there’s one technological truism we can take to the bank, it’s that, as tech gets cheaper, its rate of adoption increases. It doesn’t take a crystal ball to see we’re all about to form partnerships with a bunch of robots. We stand at the cusp of a robotics and automation explosion that some forecasters estimate will cost 7 million jobs worldwide by 2020. As if to illustrate the point, China’s Foxconn recently fired 60,000 workers and replaced them with industrial robots in a single day. While the cost savings and efficiency gains the company will reap as a result are no doubt impressive, it’s hard to ignore the elephant in the factory: 60,000 people lost their jobs. Technological change has been disrupting jobs for hundreds of years now. Robotics and other advanced technologies are continuing that trend, but at a much faster pace. So far, data shows technology has created more jobs than it’s destroyed—cold comfort to individuals who suddenly finds themselves without work. What should those of us working in U.S. manufacturing do? Sign a pledge to never, ever buy a robot? Hardly. Partnering with those advances and others like it are why the manufacturing sector in this country has a future. Forgoing it would be foolish. What’s needed is even more partnership of a kind that’s far more radical. The coming robotics and automation boom will yield mind-boggling productivity with fewer workers, but it’s important to keep in mind that fewer workers almost certainly means fewer consumers. There is no such thing as a strong manufacturing sector if real people can’t afford to buy what we make. In the United States, a looming skills gap of some 2 to 3.5 million workers threatens the competitiveness of our entire industry. 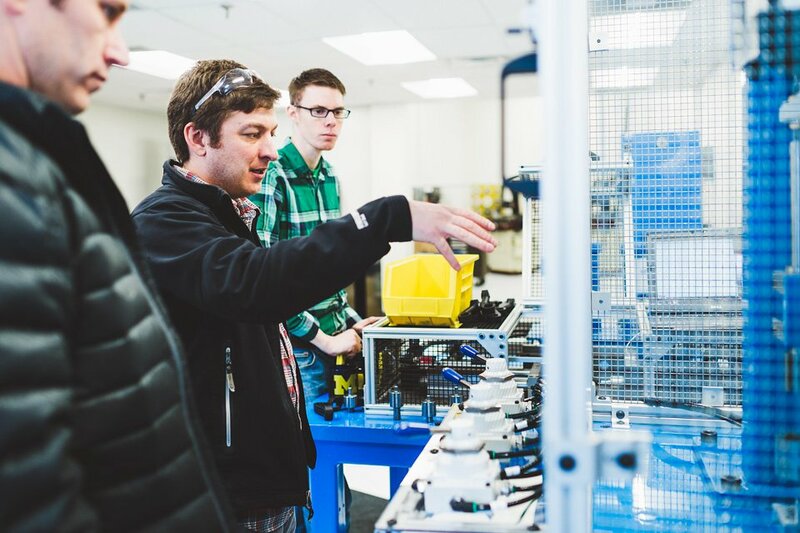 Beyond the call for better and earlier STEM education in classrooms and technical colleges, manufacturers must join efforts with government and industry to ensure the need for skilled workers is met now. Already the U.S. faces mounting hardships due to job loss in particular populations and regions. From the declining relevance of coal in Appalachia to the Midwestern worker whose lack of 21st century-ready education has made her obsolete, the pain of offshoring, automation and declining fossil-fuel use can’t be adequately captured by BLS data or a Bloomberg graph. Adding to that pain with a slew of robots and other advanced automation technologies without countering it in some meaningful way (a.k.a. with jobs) poses real dangers to our industry and our country’s long-term stability and economic health. Radical partnership requires we do more than pull a Foxconn. Instead of hoping displaced workers figure it out on their own or that the forecasted job loss is wrong, we need to work to alleviate the hurt robotics and automation are inflicting on the American workforce. Government investment at the federal, state and local levels must combine with private-sector investment and workers’ efforts so that more families, individuals, towns and neighborhoods don’t fall to the wayside in the coming years. Programs that upskill technologically displaced workers could be funded through a variety of taxes, tax incentives and private-sector investment. Tax breaks could be offered to companies willing to foot the bill for extensive on-the-job training. Targeted tax incentives, grants and zero-interest loans could be offered to displaced workers for technical school or community-college classes that better equip them to work in the new economy. These partnerships — not just the technologies — of manufacturing’s future are central to our national competitiveness. From joining forces with disruptive technologies to ensuring displaced workers have the skills and training they need to keep earning a paycheck, radical partnerships are the best path to a brighter future for all of us. To find out how a partnership with MakeTime can make your company more competitive, click here. Ryan Kelly is the director of business operations at MakeTime, a tech company radically simplifying the production of CNC machined parts.